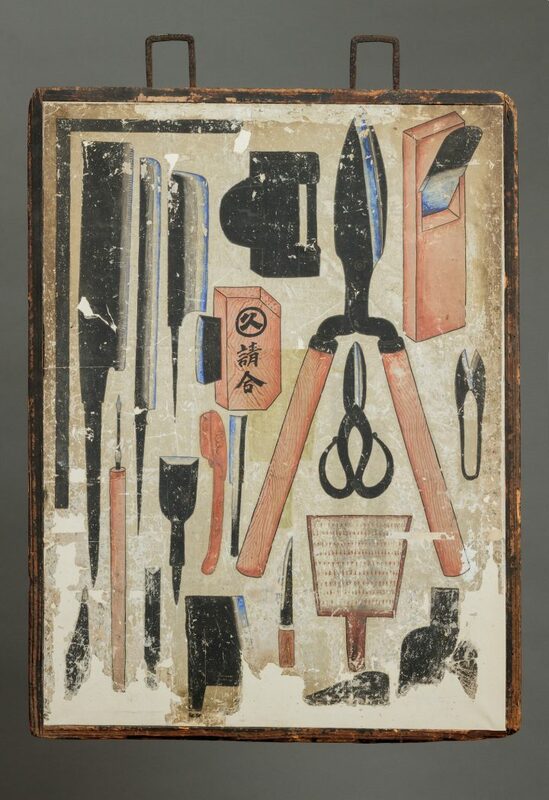 An exhibition at the Mingei International Museum showcases the artistry of kanban, a genre of handmade sign that rose to prominence during the Edo Period. 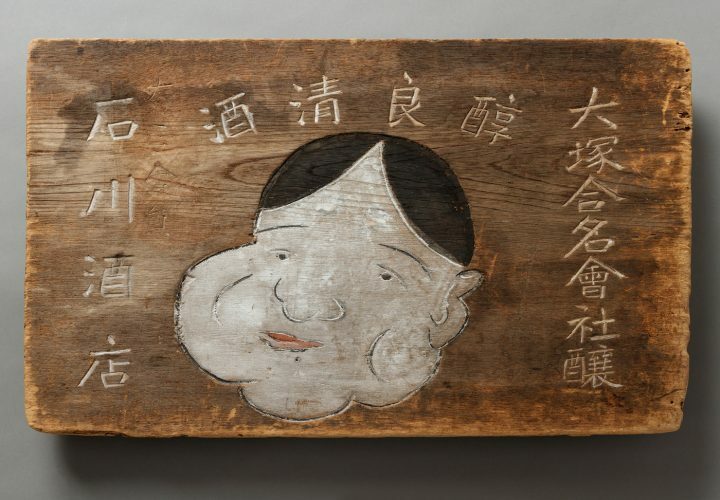 It’s a centuries-old art form that is little known today: the handmade street signs of Japan that once lined commercial streets, long before the era of the neon sign. 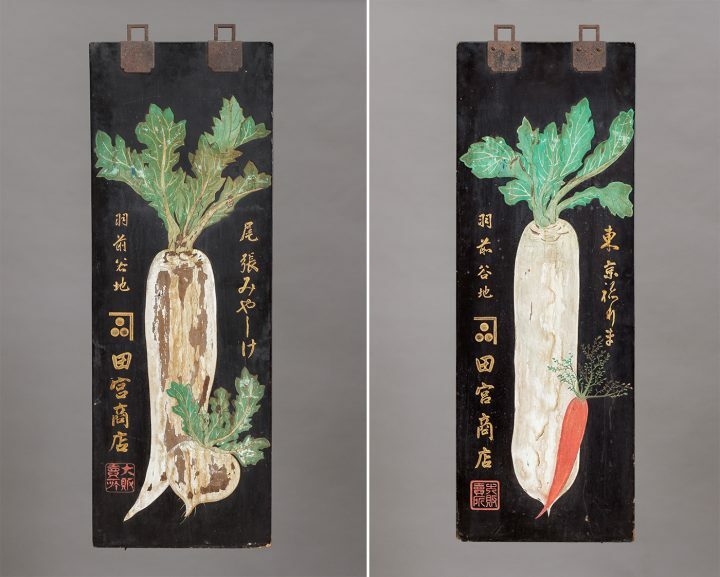 Known as kanban, these ancient advertisements were highly specific, not only in terms of the goods they marketed, but also in terms of their designs and messages. Shop owners often commissioned professional artisans known as kanban-shi to craft them, at times splurging more on a calligraphy specialist to spell out their businesses’ names in beautiful characters. The signs promoted everything from sake to wigs to laxative pills for a healthy stomach. 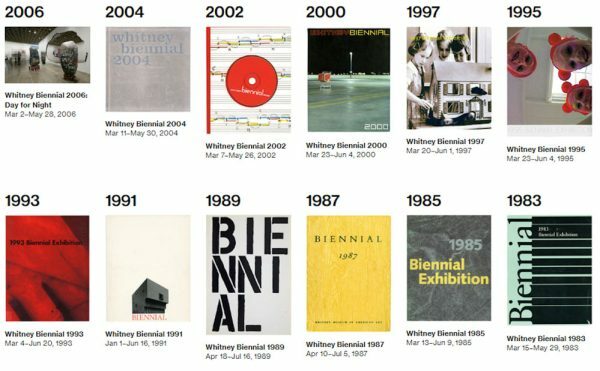 About 60 examples of kanban are currently on view at San Diego’s Mingei International Museum in an exhibition curated by Alan Scott Pate. 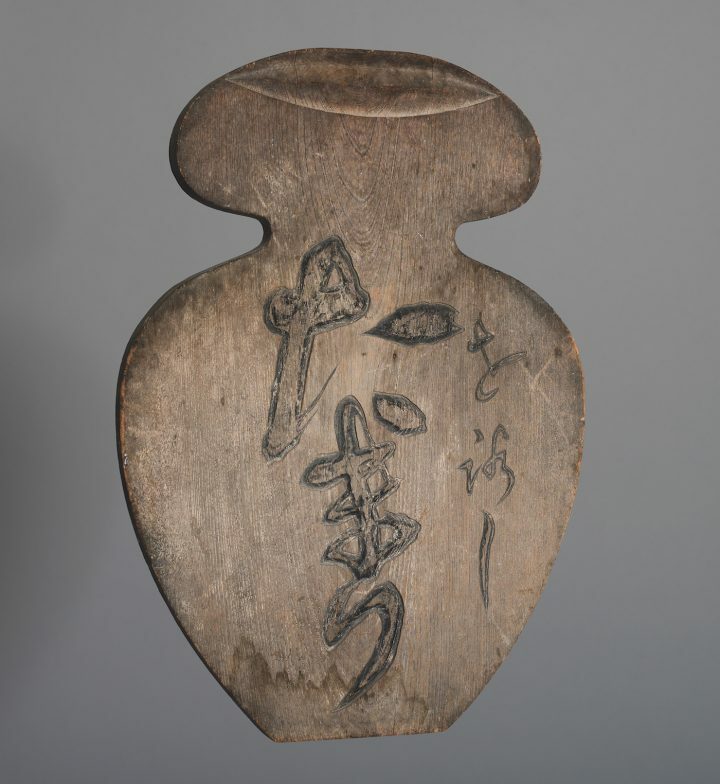 Produced largely during the Edo and Meiji eras, at the time these signs were regarded less as artworks than as functional placards, but collectors began preserving them as early as the late 19th century, and many are now in museum collections. There were once kanban to represent almost every trade, carefully crafted before the arrival of modern materials like the shiny metals and neon that gradually replaced them. Unfortunately, as many were made made of wood and subject to nature’s forces, their survival rate was relatively low. The exhibition, simply titled Kanban, presents a rare opportunity to examine dozens of examples that not only speak to a unique form of craftsmanship, but also serve as historical records of commerce in Japan. You won’t experience that same frenzy of a crowded Edo street at the museum, where the signs are neatly displayed and organized by the products they promoted. That it’s easy to understand the intent of most, at a glance, is a marker of their success. A plain wooden sign advertising soy sauce, for instance, takes the form of a curvy bottle and even has a subtly carved lip at its top. Another tall plank simply features a bulbous, long-stemmed pipe that has inscribed, on its handle, the shop’s name and address. Signs often relayed such basic details, but their clever forms also enabled those who were illiterate to navigate the many storefronts. 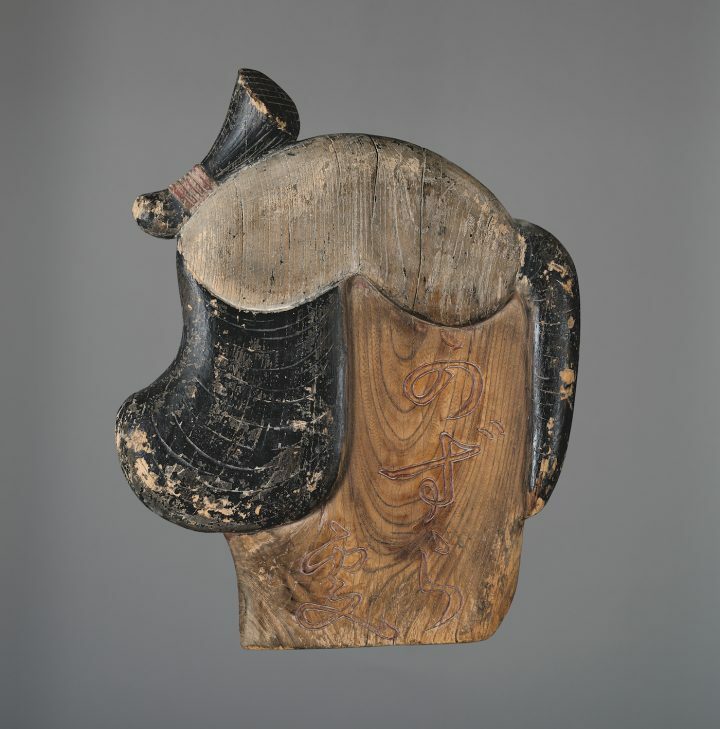 Made of materials including wood, bamboo, paper, fabric, and iron, kanban often took on incredibly sculptural forms. Mokei kanban refers to an entire style of signs that replicated in 3D the objects they advertised. 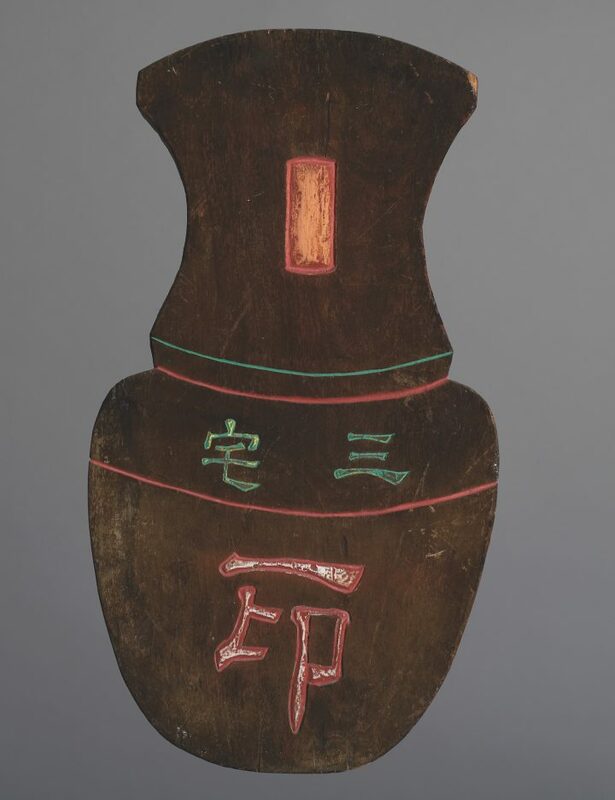 On view at the museum is a painted wooden sign carved in the shape of traditional geta sandal, complete with thick straps made of red leather. 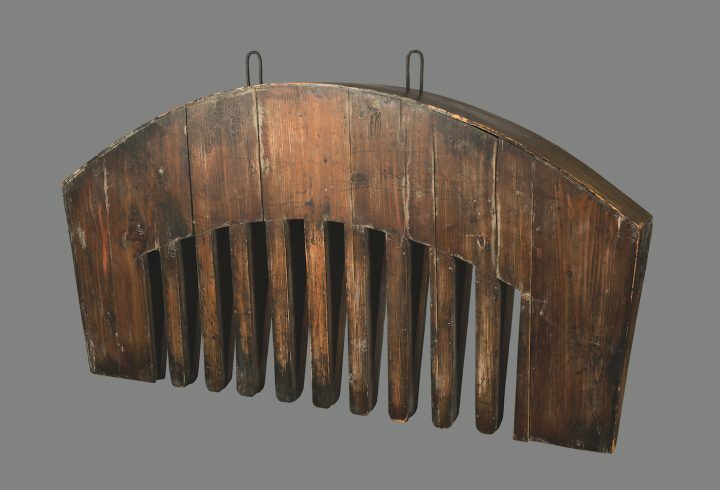 There’s also a large sign that once hung outside a comb maker’s shop; fashioned to resemble the grooming strip, it’s four feet long and features a rigid row of wooden teeth. The comb is one of the most bare bones signs on view, but there are also incredibly ornate kanban, and some so treasured that a storeowner would have taken the sign indoors at the end of the work day. 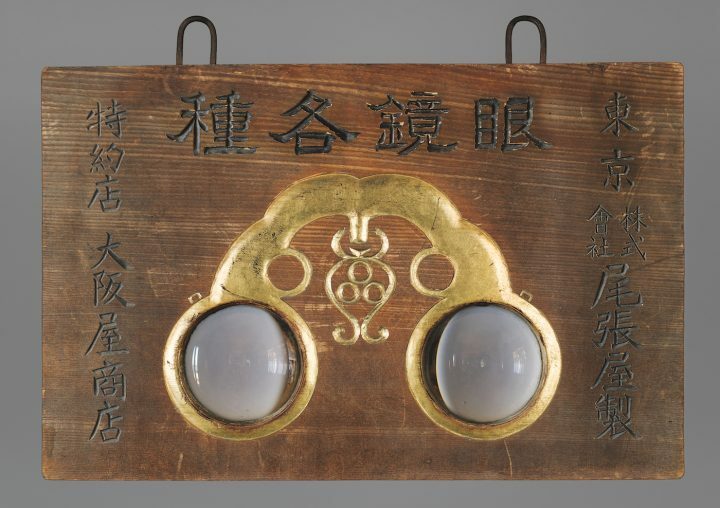 One particularly clever design survives from an eyeglasses store: the double-sided placard features golden lacquer frames embedded with convex, clear rock crystal lenses. The gleaming surfaces would undoubtedly have caught the attention of passersby, who would have seen the elegant frames as an example of the skilled engineering and luxury goods available a few steps away. “The most successful kanban convey the identity of the shop, its contents, and the prosperity of the merchant,” Pate said. In that sense, these handmade signs were no different than the electrifying jumbotrons that fill, say, Tokyo’s famed Shibuya Crossing, which endlessly flash advertisements representative of brands. But although they are static, they are dynamic, and their power to intrigue and even seduce endures to this day. Kanban continues at Mingei International Museum (Balboa Park, Plaza de Panama, 1439 El Prado, San Diego, California) through October 8.